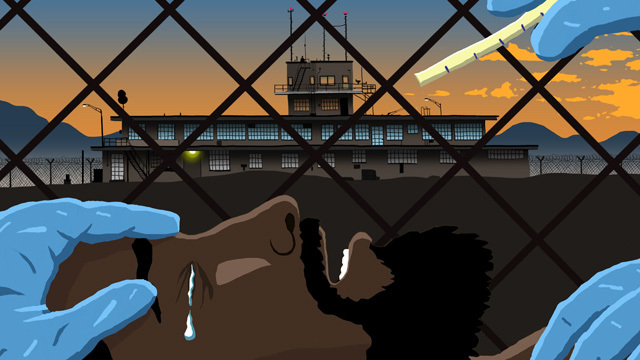 An image from the animated video, “Guantánamo Bay: The Hunger Strikes,” showing a detainee being force fed. Courtesy of The Guardian. Since enrolling in my current public history course at the University of Minnesota, I have been working with peers to connect Guantánamo Naval Base to a local site here in Minnesota. The Guantánamo Public Memory Project’s traveling exhibit came to St. Paul, MN, in February 2014, and we were looking forward to sharing our work. By examining Guantánamo Bay’s and Minnesota’s sites and histories, questions that we found important to consider and grapple with were: How are we to raise awareness of difficult events, actions, etc. in the present and in the past, such as infringements on rights for example, and how do we remember such events and those involved on all sides? In exploring the above questions in readings and discussions, the medium/experience that most affected me throughout the semester was viewing the animated video, “Guantánamo Bay: The Hunger Strikes.” Created by Mustafa Khalili and Guy Grandjean, it was featured on The Guardian’s website on October 11, 2013. As the title suggests, the primary goal is to shed light on the detained men’s decision to protest their conditions and situations by going on hunger strikes. The video is animated and the narrator follows the daily experiences of two men. These experiences are based off of testimonies taken from five men held at the Guantánamo Bay prison camp. It begins with images of the detention center and then focuses on one of the men being forcibly fed. Other experiences that are shown include: illness in the hospital, general treatment from the guards, and reasoning behind the hunger strikes. Animation can be a potentially risky medium, but this video is very effective in its format and its use of the five men’s testimonies. The audio component drives the video, not only the voice of the narrator but particularly the music and the sounds—guards rushing into the room, chains clinking in tandem with body movements, and the gasps and groans when the feeding tube is forced up the nose and down into the stomach. What the creators seek to elicit from the audience is empathy and to promote awareness of these horrible conditions. This is one of the aspects that makes the video so powerful. The second is how the creators use the testimonies. As I watched the video and then read the creators’ explanation of putting this together, I thought about Naomi Paik’s article  on rightlessness with the way HIV-positive Haitian refugees were treated when they were held in camps. Paik used the archived testimonies of these Haitians to explore their status and history of rightlessness. One way they protested their conditions was by going on hunger strikes, which is what we are seeing with many of the men now detained. Already in a place of legal limbo, these men also are in a limbo where they do not feel they are living but through the use of forced feedings and other methods, they are kept from physical death. The animated video conveys this message as well as their status of rightlessness. Many of these men have been detained, cleared, but not yet released. They can do little in response to tormenting conditions and treatment, and their choice to not eat has resulted in the forced feedings. The video ends with the pictures of the five who gave their testimonies about their experiences. The creators worked with the detainees’ legal counsel and came up with a smart, accurate, and effective tool to raise awareness. The visual and aural aspects of the video allow the viewer to respond and feel for the men still detained. How we will remember the current use of the Guantánamo Naval Base and the treatment of those imprisoned there, though, is still unknown. And lastly, this animated video demonstrates it is another medium that allows us to question how we talk about difficult subjects in the present and in the past. Naomi Paik. “Testifying to Rightlessness: Haitian Refugees Speaking from Guantánamo.” Social Text 2010 28(3 104): 39-65. Posted by Kaila Akina, PhD student in Anthropology at the University of Minnesota-Twin Cities.